Actually, we just got hit with snow. But I just got rained on with crochet commissions. Just yesterday, I posted about trying to expand my business, and last night I *encouraged* my little sister to send out invites to my page to all her friends. Turns out one of my cousins' fiancees ( I have several cousins that are getting married soon) is interested in items for their family Christmas gifting. So I got flooded, a bit. Luckily I finished an order last night, and am on the edge of finishing another one. Last year, I made my first donation to my school's annual auction, and I wanted to up the ante this year. Unfortunately, I was a bit behind, as the auction is this Friday. 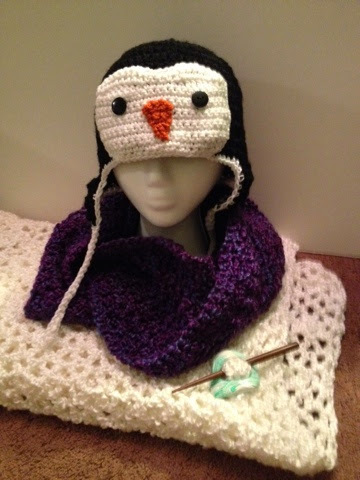 I am pleased with my donation, especially the penguin hat. Next year, I'll be trying to be prepared before the call for donations goes out. 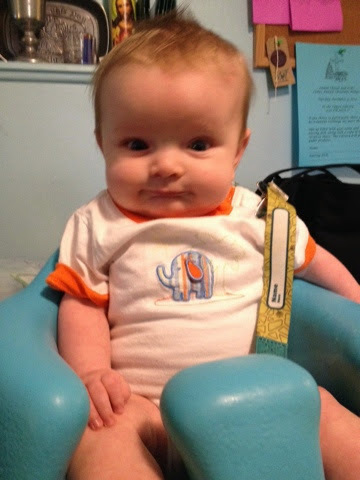 We're still trying to enjoy the little-ness of our munchkin- but he's getting so big, so fast! I want to make so many things for him, but other projects are getting in the way. I'll be calling off custom orders at the beginning of December so I have time for gift crafting, and hopefully I'll get to some woolies. For now, I will continue to be grateful and continue to pray for wisdom. Thank you all for your prayers and warm thoughts as well. well, that's a lot of blessings! good to have limits too in what you take on, as you mentioned! your little boy is very dear!